While I do not have children yet, I am doing my best to prepare my knowledge for when they do become a part of my life. 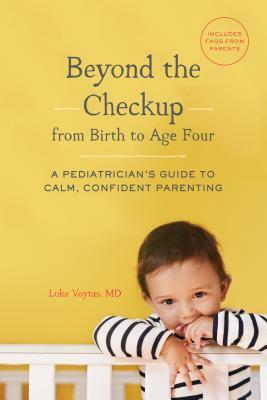 Consequently, books like Beyond the Checkup seem to be a perfect resource for parents, as it is written by a pediatrician. That being said, I think I’m probably a little biased in wanting an older, more grandfatherly pediatrician writing books like this. After all, a lifetime of experience seems to speak more than just 15-years-worth of it. Regarding the book’s content, Luk Voytas does a reasonably good job of presenting the big problems that might come up in a child’s first four years. While he does use scientific studies to back up his suggestions, there are some instances where it’s unclear whether or not there is any science behind his opinion, or if it’s his own personal thoughts. I did appreciate the “case studies” in the back of the book, as I could see each of the ailments contained therein being something I’d want to reference in case it would happen with my child. My only other qualms with this book have to do with the “asides” and the gender of the baby being referenced. Occasionally, Voytas will have a box with a little bit of extra information about a topic, but these boxes will often break the flow of a paragraph and seem to be more in the way than they should be. I also didn’t particularly like how Voytas switched between male and female pronouns to describe the generic “baby” that the reader should have. I’d either say be consistently male or consistently female or at the very least use gender-neutral pronouns to describe the reader’s baby. An OK reference for parents with or expecting babies, I give Beyond the Checkup 3.0 stars out of 5.